She gained detailed knowledge about running a food production facility and honed professional skills working with a diverse team of employees. Conrad was even able to sample the flavors from time to time. Her favorite: Maine Wild Blueberry Crisp. In the end, however, she says it was the people, not the product, that kept her excited about the job. “Everyone was incredibly welcoming and helpful, and I always looked forward coming into work. I could not have asked for a better group of people and a better atmosphere in which to grow and learn,” says Conrad. Back at UMaine, when she isn’t in class, Conrad can often be found at the New Balance Student Recreation Center or, in winter, skiing on the trails in the DeMeritt Forest. Conrad is expecting to graduate in December 2018. I completed my first year of college at St. Lawrence University in Canton, New York. Aside from being a long way from home, St. Lawrence is a very small school, and I decided that I wanted a larger campus and a larger student body. Additionally, UMaine offers food science as an undergraduate major, which was definitely alluring for me. There are a number of interesting and exciting majors offered at UMaine for undergraduates, and I like that I don’t have to go far from home to study what I want. 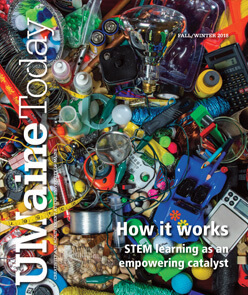 How has UMaine shaped your academic interests? The food science program at UMaine has shaped my academic interests drastically. The small size has allowed me to have a personal relationship with all of my professors. My professors all inspire me, and make me excited about the major I have chosen because I see their passion and excitement for what they teach, as well as for their research. How would you define the opportunities for student success at UMaine? Is there any particular initiative, program or set of resources that helped you succeed? While there are certainly a variety of opportunities for students at UMaine, I believe that it is the student’s responsibility to be proactive about finding these opportunities, and determining which ones are most beneficial to them. I utilized the Career Center to get help enhancing my resume, and I was fortunate enough to participate in research with a professor. I think that opportunities are always around us, but they show themselves when we have the motivation to go find them. At UMaine, there are plenty of areas to get involved, and there are no shortages of chances for new students to participate if they are interested. I have a personal relationship with all of my food science professors. Each and every one of them has inspired me in their own way. All of my professors have a clear passion and excitement for science, research, teaching and, of course, food. I am so fortunate to have had mentors and teachers that are enthusiastic about food science; their enthusiasm makes me excited to one day be part of the food industry. What are your plans for your time following UMaine? After UMaine, I plan to attend graduate school in order to receive a master’s in food science. I have a keen interest in microbiology and fermentation science. I am also very passionate about proper nutrition, and I hope to work in the food industry to bring nutritious, wholesome and affordable food to consumers. I think one of the best things students can do to find opportunities (and find the thing that they are passionate about) would be to go after whatever they are most excited about on campus, whether it be campus radio, or research or a club.